321937716 – NOTE: You are purchasing a standalone product; MasteringChemistry does not come packaged with this content. MasteringChemistry should only be purchased when required by an instructor. For one-term Courses in Organic Chemistry. A comprehensive, problem-solving approach for the brief Organic Chemistry course. 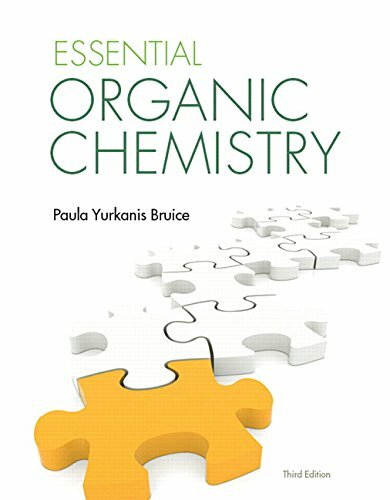 Modern and thorough revisions to the streamlined, Essential Organic Chemistry f ocus on developing students’ problem solving and analytical reasoning skills throughout organic chemistry. Organized around reaction similarities and rich with contemporary biochemical connections, Bruice’s Third Edition discourages memorization and encourages students to be mindful of the fundamental reasoning behind organic reactivity: electrophiles react with nucleophiles. Developed to support a diverse student audience studying organic chemistry for the first and only time, Essentials fosters an understanding of the principles of organic structure and reaction mechanisms, encourages skill development through new Tutorial Spreads and emphasizes bioorganic processes. Contemporary and rigorous, Essentials addresses the skills needed for the 2015 MCAT and serves both pre-med and biology majors. This title is also available with MasteringChemistry – the leading online homework, tutorial, and assessment system, designed to improve results by engaging students before, during, and after class with powerful content. Instructors ensure students arrive ready to learn by assigning educationally effective content before class, and encourage critical thinking and retention with in-class resources such as Learning Catalytics™. Students can further master concepts after class through traditional and adaptive homework assignments that provide hints and answer-specific feedback. The Mastering gradebook records scores for all automatically graded assignments in one place, while diagnostic tools give instructors access to rich data to assess student understanding and misconceptions. MasteringChemistry brings learning full circle by continuously adapting to each student and making learning more personal than ever—before, during, and after class.